The Parthasarathy temple is in the heart of Chennai, in Triplicane. It is one among the 108 divyadesams. Lord Krishna is worshipped in the name ‘Parthasarathy’ in this temple, a Sanskrit word meaning ‘charioteer of Partha ( Arjuna) ’. It is said that Veda Vyasa rishi who wrote Mahabaratha longed to see SriKrishna as the chariot driver and Krishna Himself gave the Maharishi a figurine of Himself in the chariot driver getup. A king by name Sumathi, showered his love toward the Lord Balaji of Thirumala. But he wished to worship Lord Balaji as Lord Krishna. To grant his wish, Vankatesa Perumal appeared in front of the king as Lord Krishna at this place in the pose which he stood in the Mahabharatha war, hence called as Venkata Krishnan. 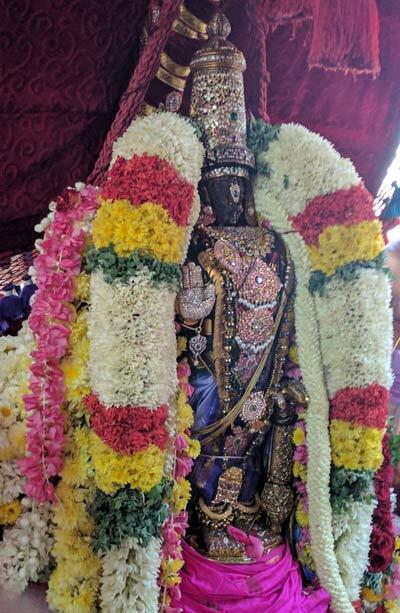 The Moolavar of this sthalam is Venkata Krishnan. Along with Rukmani , he holds sword in one hand, Varadha Muthirai on the other hand and his brother Balaraman on his right, Sathaviki on his left, son Prathyumnan, Grand son Aniruthan are also found near the Moolavar. This is one of the Sthalam where the Lord shows his seva along with his three generations. He is found in standing (Nindra thirukkolam) position and facing towards East direction. He is seen exactly as he was in the Kurushetra war as the chariot driver and the as The One who preached the Baghavat Gita to Arjuna who was reluctant to participate in the war. He is seen with a majestic moustache as was the tradition of the Yadava clan, a darshan you can get nowhere! The characterstic SriChakra of the Lord Vishnu is not seen here as he had kept his promise to Duriyodhan not take part in the Mahabarath war. In front of the moolavar is the utsavar Partasarthy with His consorts Sridevi and Bhoodevi. The utsaver Parthasarathy has scar marks in His face that symbolises the wounds afflicted by Bheeshsma's arrows while Krishna was driving Arjuna's chariot during the Kurushetra war. The history of the temple goes back beyond the eighth century. Pallava kings were maintaing this temple and later by Vijayangara and Nayakar kings. As we enter the temple we come across the ‘pushkarani’. The tank contains five wells and lies opposite to the eastern entrance of the temple. The temple has two gopurams (tower) each in eastern and western directions.and five vimanams namely Anatha Nilaya Vimanam over the sanctum sanctorum, Ranganathar Sannathy vimanam, Ramar sannathy vimanam, Narasimha sannidhi vimanam and Andal Sannithi vimanam. The shrine of the consort, Vedavalli Thayaar, is located parallel to the sanctum. The shrine of Narasimha (Thellia Singhar) faces west and just as the main sanctum, there is a separate entrance and Dwajasthambam ( flag post) for Narasimha. The deity is seated in Veetrirundha Yoga thirukolam (Sitting Posture) There is a shrine for Ranganathan and Rama located in the passage to the main sanctum sanctorum. Ranganatha is in Bujanga Sayanam ( reclining ) facing east. There is a shrine for Gajendra Varadar. There is a shrine for Rama and He is seen here with His consort Sita , Lakshmana, Bharatha, Shathrugna and Hanuman is seen opposite to the Rama shrine. There are shrines for Ramanujar, Vedantha desikar and Manavalar in the maha mandap. The temple is glorified in the Divya Prabhandam and three alwars Peiazhwar, Thirumazhisai alwar and Thirumangai alwar have sung pasurams about the Lord here. The temple is administered by the Hindu Religious and Endowment Board of the Government of Tamil Nadu. The temple follows the traditions of the Thenkalai sect of Vaishnavites tradition . As there are two dwajastambhams one each for Parthasarathy and Yoga Narasimhar two brahmotswams are conducted. 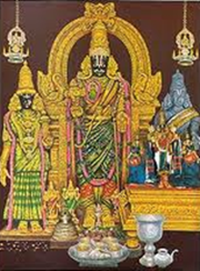 The temple has grand brahmotsavams for Sri Parthasarathy swami during the Tamil month of chittirai(April-may).In the month of vaigasi,Sri Varadarajar uthsavam, Sri Nammalwar uthsavam(vaigasi-visagam) and vasanthothsavam are celebrated. Brahmotswams for Sri Azhagiyasingar is celeberated during the Tamil month of aani (June-July).There are also grand utsavams for Sri Ramanuja(April-may) and Sri Manavalamamunigal(oct-nov) besides utsavams for Alwar and acharyas. Next to Srirangam , during Vaikunta Ekadesi celeberations lakhs of devotees arrive here for the 'Sorka Vasal' darshan. Because of the association of the temple with Krishna, Tiruvallikeni came to be regarded as the Southern Brindavana. Moolavar of this sthalam is Sri Venkatakrishnan in Nindra Thirukkolam (Standing posture) facing east. Thayaar in this sthalam there is aseperate sannidhi for Andaal. Pushkarani(holy tank) of this place is Kairavini saras,(allikeni). Triplicane is in the heart of the Chennai city well connected with Metro bus services, and Mass Rapid Transit SystemMRTS services with a station Tiruvallikeni/Triplicane. Where to Stay? There are several budget hotels near Triplicane, Royapettah area to super deluxe five star hotelsa a few kilometers away. Other interesting places around Triplicane The famous Marina beach is just a kilometer away from here. Madras University, Presidency college, Light House, Police Commissioner's office are within a kilometer from here. The MA Chidambaram cricket stadium, Express Avenue ( a large mall) are in the vicinty. Freedom fighter and Tamil poet Mahakavi Bharthi's house, which is now a memorial is jsut a block away from the temple.